I remember this. Oh how I remember this. 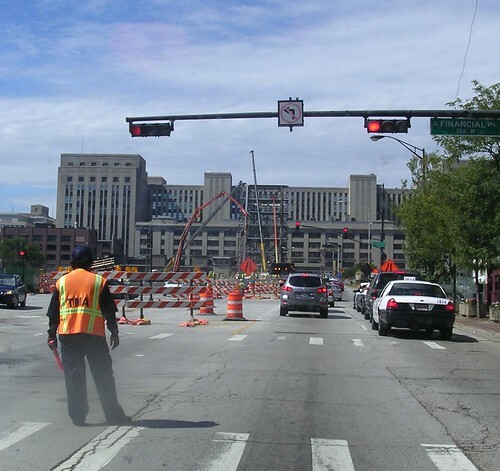 The City of Chicago decided the bridge off the Eisenhower Expressway that dumps you into the city just south of what's called "The Loop", needed major repair and renovation. At that time, they also decided to rebuild the exit and on ramps to this stretch of highway AND repair and resurface the Congress Parkway which is what the Eisenhower turns into when it goes under that imposing building in the distance. Mayor Daley loved his middle of the street planter boxes and Congress has three of them. Sewers were redone as well as curbs and gutters. This is considered the "gateway" into Chicago and it was looking more than a little shabby. Not quite 2 years after I took the above photo, this is what it looks like now. 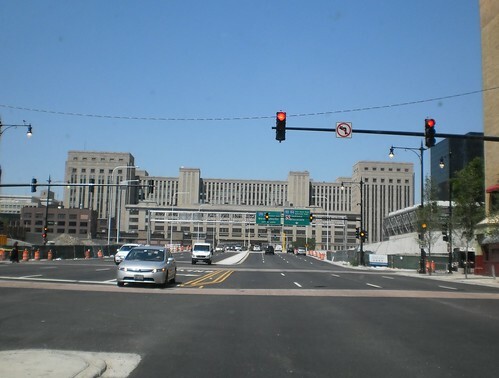 The on/off ramps haven't been completed but the road going under the Post Office, that big building, is done. Also, brick crosswalks were added. The medians were redone. Not all the plantings have been completed but trees have been added to the medians behind me. It was a pleasure to drive into the city on Saturday. I'm thinking "they" told us to endure this for 3 years. This is only 2 years of work. There's more off to each side that needs to be completed, but this is excellent.